The outline of this study is that NF-κB decoy oligonucleotide, which won’t cause rebound or skin atrophy if used in treating AD for a long time is preferable to betamethasone valerate. NF-κB is one of the intranuclear transcription factors. NF-κB decoy makes NF-κB inactive. I found a good illustration and inserted below. GR is a steroid receptor. Steroid（Glucocorticoid）binds to GR and enters the nucleus to inhibit NF-κB-dependent inflammatory cytokine expression. 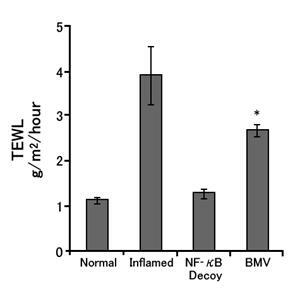 Therefore, a NF-κB decoy can suppress inflammation through a similar mechanism. Mite antigen was injected intradermally into murine ears. The Y-axis represents swelling and the X-axis indicates days after the injection. “Inflamed” means no treatment was provided and “BMV” and “NF-κB Decoy” mean these agents were topically applied for 2 weeks between the Start and Stop points (arrowed). After the Stop point, rebound was observed in the BMV（steroid）applied subjects, whereas it was not in the NF-κB Decoy applied subjects. Dermal collagen thickness was unchanged in the NF-κB Decoy applied subjects, while it got thinner in the BMV（steroid）applied subjects, which indicates atrophy. After 2-week of application, TEWL (transepidermal water loss) in the BMD (steroid) applied subjects increased, which indicates the occurrence of barrier dysfunction as has been already reported by other studies. Acetone treatment was performed after a 2-week topical application to see the epidermal barrier functional recovery. The subjects who applied the NF-κB Decoy took 24 hours to attain 100% recovery, but the subjects who applied BMD took another 48 hours or longer to recover. 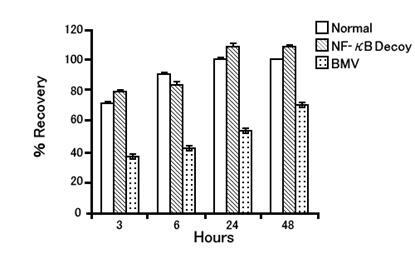 Furthermore, mRNA taken from the skin after a 2-week topical application had more expression of SKALP (skin-derived antileukocyte proteinase) and Keratins 6 & 16 (both are inflammatory keratin induced when inflammation is present) in BMV applied subjects. The above results all support Dr. Cork’s theory that prolonged use of topical corticosteroids leads to epidermal barrier disruption, which can play a causative role for rebound. The above mentioned phenomenon was not observed in the NF-κB Decoy applied group which is what this paper reported. Research and development for new AD drugs such as calcineurin inhibitors are based on the perspective of how to overcome the disadvantage of topical steroids that prolonged use will destroy the epidermal barrier and lead to rebound. In Japan, unfortunately, if we say, “Prolonged use of topical corticosteroids will cause epidermal barrier disruption and lead to rebound,” we’ll be scolded by JDA’s authorities who insist those who say such thing will just give excuses for the atopic business. Topical steroid withdrawal advocated by some dermatologists was featured by the media, which provided the atopic business with favorable excuses. The notion of the rebound phenomenon as a disadvantage of topical corticosteroids is pervading in the public. But in many cases, the rebound phenomenon is just an acute flare of the primary disease as a result of discontinuation of topical corticosteroids (TCS) at wrong timing during an inappropriately performed treatment. Steroid withdrawal is naturally recommended in the cases where AD has been replaced by rosacea-like dermatitis or topical corticosteroids have been applied unnecessarily. But insisting steroid withdrawal for all cases too much undervalues disadvantages caused when inflammation is left untreated. What is problematic with steroid withdrawal advocators is having spread the ideological information that topically applied steroids have side effects such as addiction and resistance to steroids. Dr. Takehara also presented the following opinion for the lawsuit where a steroid withdrawal advocating doctor was sued by a patient who suffered from unfavorable process after steroid cessation and went to another hospital. Steroid acne, steroid redness, skin atrophy, trichosis and bacteria/fungus/virus infection of skin, which sometimes develops locally as TCS side effects, will be cleared by stopping TCS or taking other proper measures. Steroid resistance (reduction in effect s due to prolonged use) does not occur in ordinary application. Pigmentation, sometimes observed after TCS application, is caused by dermatitis remission and not by TCS. The rebound phenomenon is problem that develops after large amounts of steroid have been taken systemically and nearly unthinkable as to TCS. This judicial trial was conducted around 2004 and this opinion was probably written then. Since the 1990s, Dr. Enomoto and others have already reported on clinical cases where TCS was thought to have contributed to serious systemic disorders or exfoliative dermatitis without adrenal dysfunction. Currently, alternative new drug development is being pushed forward in the world, having known the problem of the rebound phenomenon due to prolonged use of TCS. Who on earth let the atopic business prevail, dermatologists including me who advocated TCS withdrawal or Dr. Takehara and others who missed or denied to recognize the rebound phenomenon?